Steampunk, a sub-genre of science fiction, has become more than just a literary movement and has evolved into an artistic movement, as well. Based on an art exhibit presented by Oxford University’s Museum of the History of Science, Art Donovan’s The Art of Steampunk: Extraordinary Devices and Ingenious Contraptions from the Leading Artists of the Steampunk Movement provides a good primer on the Steampunk artistic movement. The Art of Steampunk introduces the reader to the concept of Steampunk and several leading artists creating art in this style. Although a paperback book, its visually rich presentation makes it feel like a coffee table book. The Art of Steampunk is available in paperback from Amazon and other booksellers. The focal point of The Art of Steampunk is the photography. 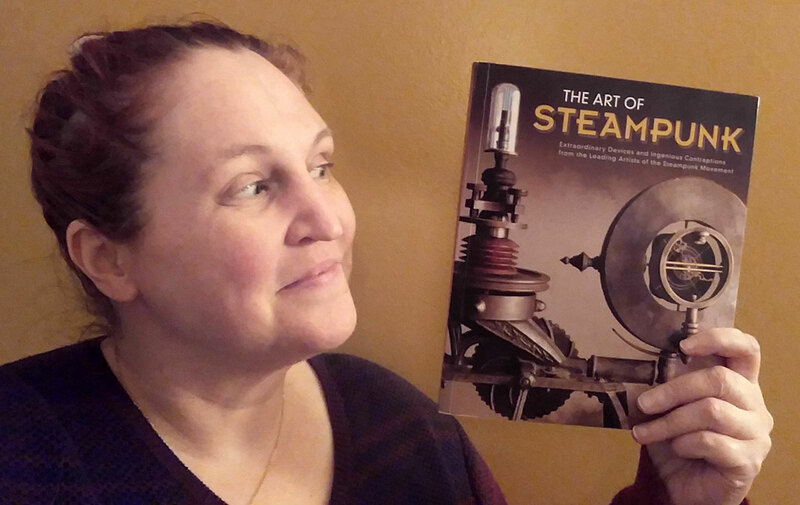 Every page features at least one picture of a Steampunk artifact, from goggles to clocks to fantastical flying machines. The images are stunning and the book’s design complements the photography. The writing is simple and easy to read and each picture comes with a detailed description of the object with some information on its context. In addition to the visually stunning content, you can read about each artist and how he or she was drawn to this distinctive artistic style. You also learn how Steampunk evolved and developed its own community, from its roots in 19th-century scientific adventures to its current lifestyle option. Some of the explanations of what Steampunk is were written in a very academic manner, making the information less accessible to a general reader. This is not so much a book you read, as a book you peruse and experience. The art is stunning and the photography probably doesn’t do it as much justice as being there and seeing the actual object. But it will do. I’ll be keeping this book to look through again and again.